Gavin Douglas Lux, 25, of Chicago, IL, passed away Friday, October 19th. He was born in Downers Grove, IL on April 1, 1993, the son of John and Karla (Deardorff) Lux. Gavin went to Westlake High School, completed his undergraduate degree from Elmhurst College and his Masters of Accountancy at Case Western Reserve University – Weatherhead School of Management. Gavin interned at Price Waterhouse Coopers (pwc) in 2016 during graduate school and immediately accepted a position as an Assurance Associate in the Chicago offices beginning September 2018. Gavin was an avid golfer, playing for both Westlake High School and Elmhurst College. He followed his love of golf working summers at Sweetbriar Golf Course in Avon Lake, OH and playing every spare moment he could find. Gavin is survived by his parents John and Karla Lux of Rochester, MN; his sister and brother-in-law, Jennifer Lux and Thomas (TJ) Brown of Mason, OH; and his sister Morgan Lux of Olmsted Falls, OH. He also leaves his maternal grandfather and wife, David and Marie Deardorff of Sun City, AZ; and his paternal grandparents, Ron and Caroljane Lux of Indianapolis, IN. Gavin is also survived by numerous aunts, uncles, cousins and close friends. A memorial service and gathering will be held on Saturday, October 27th. Visitation will be 9:30am-11am at Westlake United Methodist Church (27650 Center Ridge Road, Westlake, OH), followed by a service at 11am. A reception will be held at 1pm at Sweetbriar Golf Course (750 Jaycox Rd, Avon, OH). 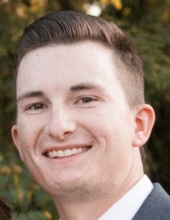 In lieu of flowers, the family asks that you consider a donation to either The First Tee, https://thefirsttee.org/get-involved/ways-to-give/donate/, or the American Foundation for Suicide Prevention, https://afsp.donordrive.com/campaign/Gavin-Lux-Memorial-Fund. "Email Address" would like to share the life celebration of GAVIN DOUGLAS LUX. Click on the "link" to go to share a favorite memory or leave a condolence message for the family.